If you need us to generate a Resource Tepee (US patent 7,495,673 B1) for you, you would need to provide us a resource utilization matrix. This is the starting point for constructing the graphic. 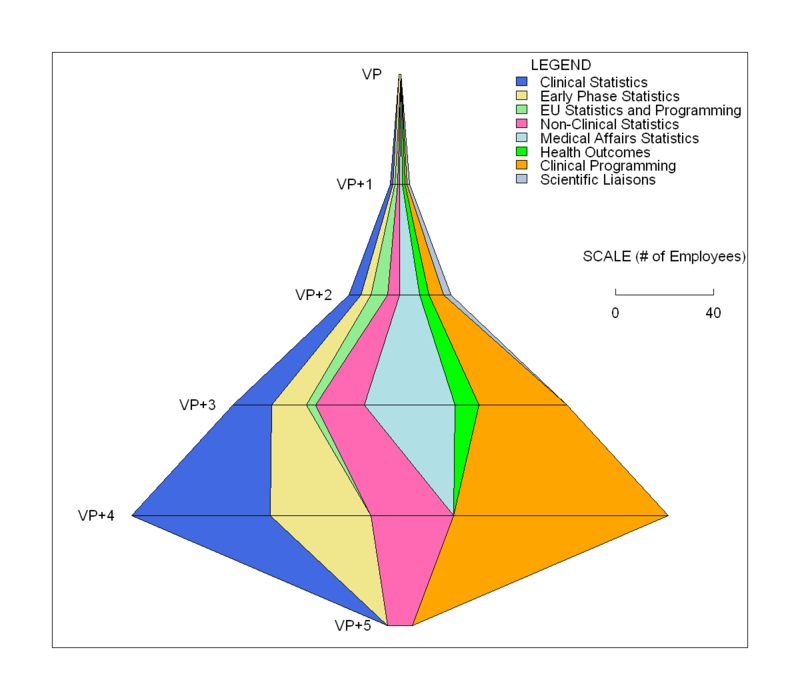 A hypothetical resource utilization matrix for FTE is provided below for a typical Biostatistics and Programming department in a large pharmaceutical company. The VP has been arbitrarily assigned to the early phase statistics group. We could alternatively have assigned 1/8 FTE to each of the functional groups reporting to him. VP+1 are the VP’s direct reports. There is one corresponding to each functional group. There are 5 personnel in the VP+2 reporting level in the Clinical statistics group, 4 at the VP+2 level in the early phase statistical group etc. Such a data set is easy to pull out off an organizational chart. Please click on the graphic to see it in better resolution.